Blemishes are caused due to hormonal changes, hereditary factors, stress, lack of proper nourishment. When the pore is clogged by natural body oils, the pores can get infected by bacteria and develop into blackheads or whiteheads. Blemishes occur mostly in women and can occur at different stages such as adolescence, pregnancy and menopause. Blemishes occur during pregnancy or menstruation because of hormonal changes. Hormones can play a crucial role in acne and blemishes. Hormonal fluctuations during pregnancy, menstruation, menopause and also the use of hormonal types of birth control can cause or worsen acne and blemishes on the face. In fact, many women experience a surge of blemishes during the start of their monthly period cycle. Though this can be frustrating, however, it is absolutely normal. 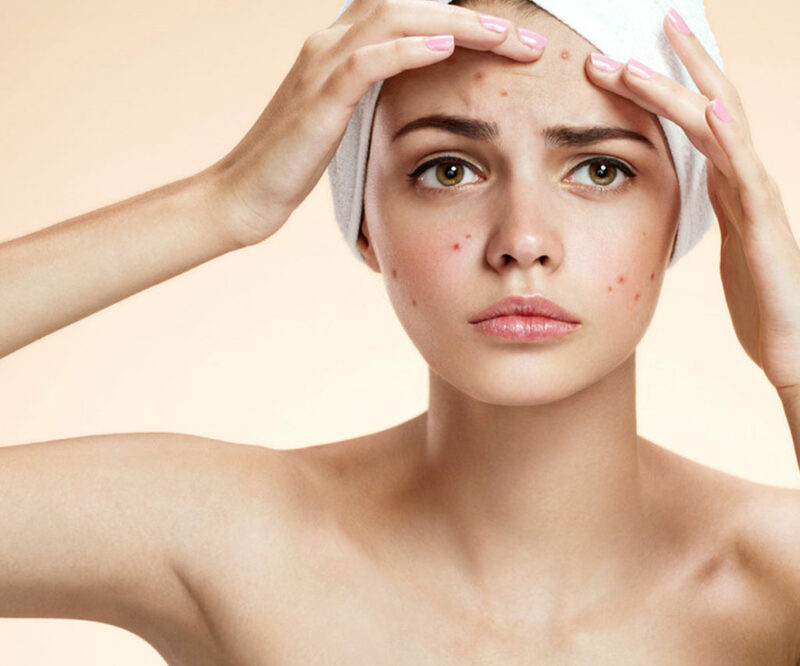 Even during peri-menopausal or menopausal period, women have acne and blemishes on the face because of the hormonal fluctuations. Excessive oil production can increase your chance of developing a clogged pore. This usually occurs during adolescence when oil glands ramp up the production of sebum because of the influence of androgen hormones. Because there is so much extra oil produced, some of it backs up in the pores and thus forms the blemishes. Are you touching your face too often? If yes, then this may become quickly very dirty and can add bacteria to the skin which may cause acne, blemishes and other skin problems. Eating too much of dairy products also cause blemishes on the face. When you find acne breakouts or blemishes on the chin, jaw line or in the neck area then it might be a sign that you are taking too much of dairy products in your diet than your body can actually tolerate. Your skin acts as an excretory system for getting rid of things that your body is not in agreement with and thus when you get an excess of dairy products it is by nature harder to digest and can come out in the form of cystic blemishes on the face, especially the lower area of your face. Try Nano Blanc skin patches to your blemishes and see the results for yourself!